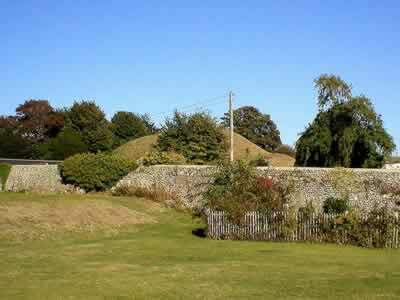 The Mount is a possible earthwork motte, which could also be defined as a 17th century garden feature, used as a prospect mound. Standing at the eastern end of a low spur, the mound dominates the entrance to north, west and south-east valleys but nothing is known as to its origin. Possibly connected to salt working, it could also be the spoil from a chalk or clay pit but the mound was considerably altered by Victorian terracing and a spiral walk to the summit. To the west, is Lewes Priory Great Gate and on higher ground to the north is Lewes Castle. The Mount is located in Lewes, off Mountfield Road, in Castle Green. 8 miles north-east of Brighton, on the A27-B2193.